Aviv Amirav, Uri Keshet, Tal Alon and Alexander B. Fialkov. Tel Aviv University and Aviv Analytical Ltd. Cold EI is electron ionization of vibrationally cold molecules in supersonic molecular beams (SMB) using a fly-through EI ion source. Cold EI is characterized by enhanced molecular ions which are the most characteristic ions for sample identification and quantification. The magnitude of this important enhancement was measured for a series of linear chain hydrocarbons from n-C9H20 to n-C40H82 with staggering results. The measured absolute enhancement of the molecular ion was a factor of 13 for n-C9H20 with pure exponential increase up to a factor of 2500 for n-C40H82. This strong effect is being reported here for the first time. Keep on reading for the obtained results and the physical principles behind them. Cold EI is the Electron Ionization (EI) of vibrationally cold molecules in Supersonic Molecular Beams (SMB), as obtained with the Aviv Analytical 5975-SMB GC-MS with Cold EI. For more details on Cold EI please visit www.avivanalytical.com or read the review article of A. Amirav, A. Gordin, M. Poliak and A. B. Fialkov "Gas Chromatography Mass Spectrometry with Supersonic Molecular Beams", J. Mass. Spectrom. 43, 141-163 (2008) (available on request). In Cold EI the abundance of molecular ions are enhanced due to the elimination of sample compounds internal heat (vibrational energy), as internally cold molecules are more stable and can better withstand the energetic encounter with the ionizing electron without breaking into fragments. An important and interesting question is by how much are the molecular ions enhanced, which is the subject of this note. The amount of sample compound internal heat depends on the compound heat capacity hence on its number of atoms. As a result, we can generally say that the degree of molecular ion enhancement in Cold EI is small for small molecules with less than 10-20 atoms and thus for example for benzene, toluene and even for octafluoronaphthalene the enhancement is less than a factor of 1.5 and is hard to observe. For medium size compounds with 20-40 atoms the enhancement of the molecular ions is easily recognized while the EI fragments are retained. For large compounds with >40 atoms the magnitude of the molecular ion enhancement can be substantial, particularly for large molecules and those that exhibit low molecular ion abundance in standard (classical) EI such as large hydrocarbons. The purpose of this note is to provide quantitative measurement of the Cold EI molecular ions enhancement and its dependence on the sample compound size. For this purpose we selected the group of linear chain alkanes (hydrocarbons) from n-C9H20 to n-C40H82. As shown in Figure 1 below at the bottom trace the classical EI mass spectrum of n-C20H42 is characterized by a tiny molecular ion with relative abundance of 1.6% while it is dominant in the middle trace of Cold EI-MS. 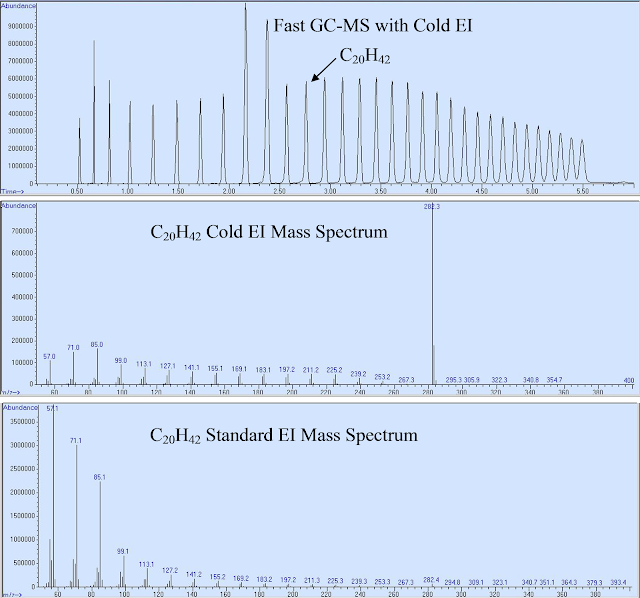 The upper trace is the Cold EI full scan mass chromatogram of a mixture of linear chain hydrocarbons from n-C9H20 to n-C40H82 (5 ng each on-column) that was obtained with a 5 m short column (0.25 mm ID) with column flow program in the 2-24 ml/min flow rate range and GC oven temperature program 50-320ºC at 50ºC/min thus eluting the n-C40H82 at 5.5 min. The Aviv Analytical 5975-SMB GC-MS with Cold EI was used for obtaining the Cold EI mass spectra while a standard Agilent 5975C MSD was used for obtaining the standard EI mass spectra with 250ºC ion source temperature. As shown in Figure 1 there is a significant Cold EI enhancement of the m/z=282.3 molecular ion of n-C20H42 from 1.6% in standard (classical) EI, to dominant mass spectral peak in Cold EI. In Figure 2 below we plot the relative molecular ion abundance in both cold EI and standard EI for the n-C9H20 to n-C40H82 linear chain hydrocarbons mixture. 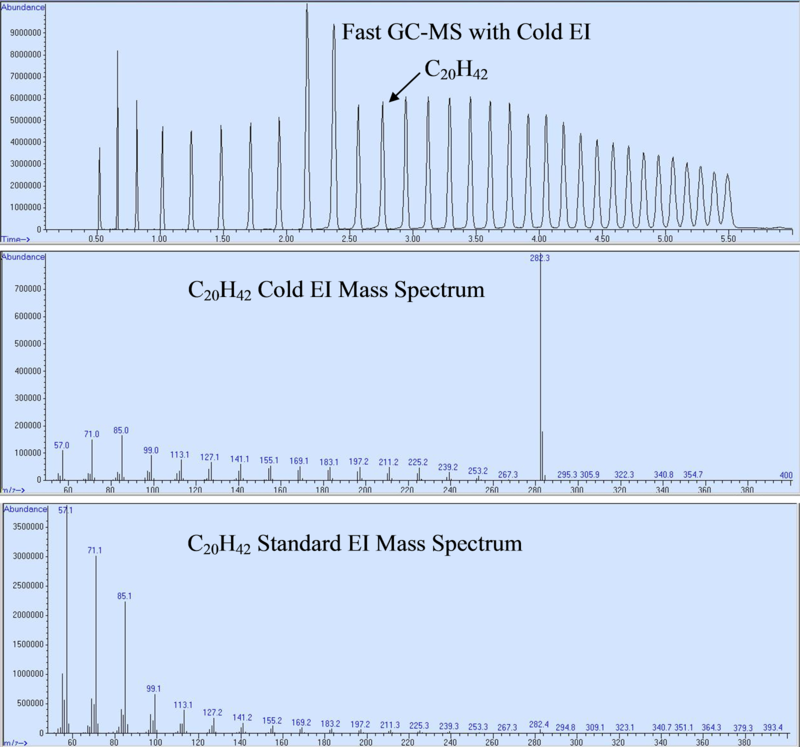 The upper set of results is the Cold EI absolute abundance which is the ratio of the molecular ion to the full mass spectrum as obtained in the total ion count. 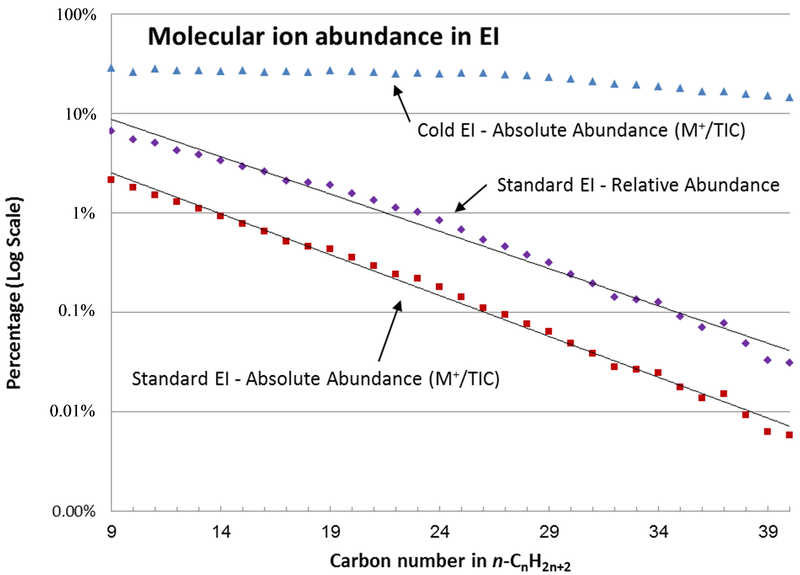 As shown, in Cold EI the molecular ion absolute abundance is about 27% and approximately carbon number independent up to C27 while for larger hydrocarbons there is a slight decline down to about 15% in C36-C40. In contrast, we observed an exponential decline of the molecular ions in standard EI in both its relative abundance of 100xM+/(m/z=57) (middle set of results) and absolute abundance of 100xM+/TIC (lower set of results). The relative abundance was 7% for n-C9H20 and exponentially declined all the way to 0.03% for C40H82 while the absolute abundance declined from 2.13% to 0.0058% for these compounds. The observation of such a large effect is reported for the first time in this note and it represents an interesting case of clean exponential decline of the molecular ion with the carbon number as demonstrated by the fitted straight lines shown in Figure 2. This exponential decline of the molecular ion abundance (both relative and absolute) can be explained in the following way. The process of electron ionization is local and thus its deposited vibrational energy is independent on the compound size. The sample compound heat capacity on the other hand is linearly increased with the number of atoms. Thus, the amount of excess vibrational energy above the onset of molecular ion bond breakage is linearly increased with the carbon number for thermal compounds that were not cooled by SMB hence are at the ion source temperature. If we assume that as commonly encountered in chemistry the molecular ion dissociation rate is exponentially increased with the available excess molecular ion vibrational energy we should expect exponential reduction of the molecular ion abundance with the increase of carbon number as observed in figure 2. This observation also suggests that only a few vibrational modes and not all are active in the dissociation and thus the RRK theory is preferable over RRKM. While this observation of figure 2 can be rationalized as above it is still surprising in its magnitude. We note that the molecular ion relative and absolute abundances in Cold EI are relatively carbon number independent since the molecular ion is stripped of all its thermal heat and only a carbon number independent portion of the ions have electron deposited energy above some onset thereby can dissociate. Above a certain carbon number the efficiency of Cold EI vibrational cooling starts to reduce due to increased velocity slip effect. 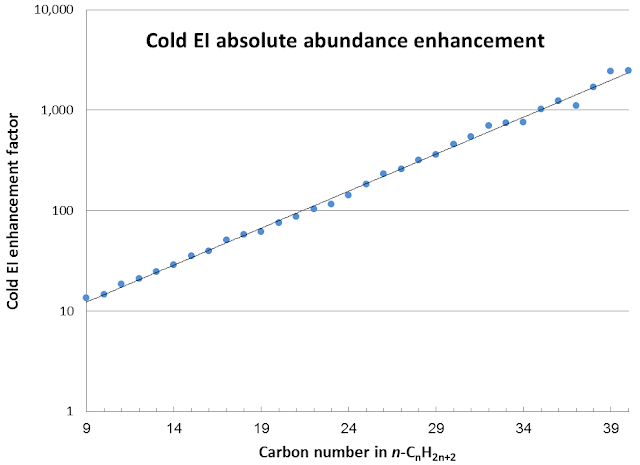 Thus, above C27 the absolute Cold EI molecular ion abundance starts to slowly decline while the relative abundance always remains 100% meaning that the molecular ion is always the dominant ion in the Cold EI mass spectra. 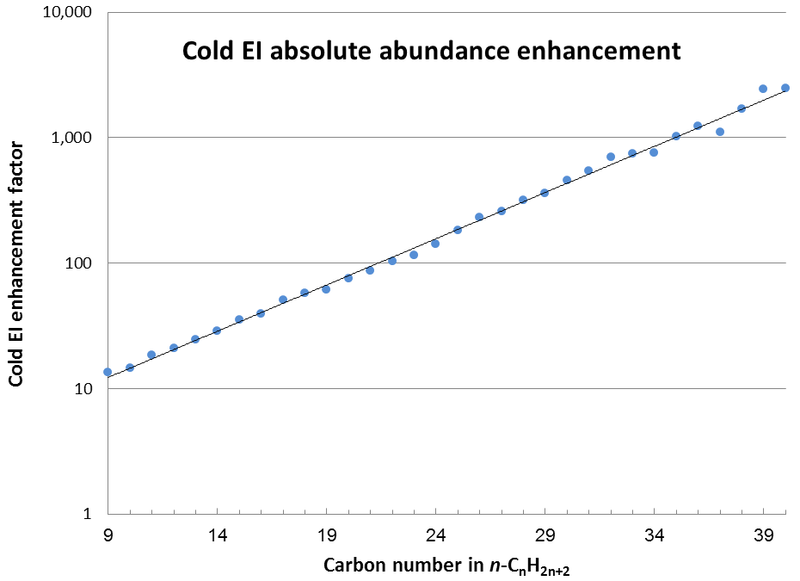 In Figure 3 below we show the measured enhancement of the molecular ion in Cold EI as given by the ratio of the absolute molecular ion abundance in cold EI to the absolute abundance of the molecular ion in standard EI. A pure exponential increase in the enhancement of the molecular ion is observed and while the enhancement of the molecular ion is only 13 for n-C9H20 it is a staggering factor of 2500 for n-C40H82. Clearly the value of Cold EI molecular ion enhancement depends on the ion source temperature which was 250ºC in the reported experiments. With lower ion source temperatures the molecular ions will increase in standard EI but at the expense of increased ion source peak tailing for the heavy hydrocarbons that involves with reduced TIC signal, poorer chromatography and higher RSD. In addition, the enhancement of the molecular ions also depends on the hydrocarbons structure and as they become branched the abundance of the molecular ions decline in both Cold EI and standard EI but the effect is stronger in standard EI. For example, in the isoprenoid isomer of C18H38 the molecular ion m/z=254.3 is reduced in standard EI by an additional factor of 9 compared with n-C18H38 while in cold EI it is reduced by a much small factor of 2.0. Thus, for branched isomers the enhancement of the molecular ion in Cold EI is further increased. Finally, we note that the enhancement of the molecular ions in Cold EI is directly translated into sensitivity improvement and lower LOD since Cold EI has similar TIC signal as standard EI and the enhancement of the molecular ions in cold EI similarly improves the analysis selectivity in complex petrochemical matrices. Great stuff, Aviv! I would think that this system would be excellent for petroleum biomarker determinations, both for characterizing potential petroleum deposits, and for "fingerprinting" petroleum products/samples that have been accidentally or intentionally discharged into the environment. Thank you Jack for the complements. I agree with your assessment as stated and can add that an important reason for these applications is that the molecular ion in Cold EI is also enhanced versus the nearby high mass fragments of M-15, M-29 and M-43 so that their isotopomers M-14, 28 and 42 do not complicate data analysis. Our suggested fingerprinting of oil products and spills is via the majority hydrocarbon isomers that provide a unique oil fingerprint and this topic will serve for a future Blog note. One important reason for us to launch the Blog for Advanced GC-MS is that we observed the success of the Restek ChromaBlography at http://blog.restek.com/ and the wealth of GC information provided in it thus we decided to have our own Blog and dedicate it to Advanced GC-MS topics.